Lenny Schwartz of Pinnacle Roofing Professionals, LLC has earned the solar industry’s leading recognition of technical sales expertise from the North American Board of Certified Energy Practitioners (NABCEP®), and is now a NABCEP Certified PV Technical Sales ProfessionalTM. NABCEP is the most highly respected and well established national certification organization for renewable energy professionals. 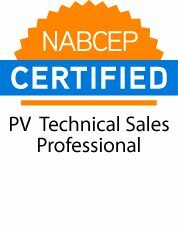 Designation as a NABCEP PV Technical Sales Professional is widely recognized to be the most important and meaningful certification of its kind in the solar industry. To earn his NABCEP certification, Schwartz was required to first document relevant education and experience. Then he had to pass a rigorous exam that covers the breadth of the knowledge, skills, and abilities required to competently perform a solar site assessment, conduct performance and financial analysis, develop a preliminary system design, and prepare a detailed sales proposal for the customer. The exam assesses knowledge on subjects as diverse as financial incentives, utility bills and rate structures, electric load analysis, fundamentals of electrical and mechanical system design, and PV system types and components. “One thing you can be assured of when hiring a NABCEP Certified PV Technical Sales Professional is that your project won’t be their first,” said Richard Lawrence, Executive Director of NABCEP. “Anyone who makes the considerable effort required to earn NABCEP certification has documented their training and experience as part of the eligibility process. They have also made a very real commitment to upholding high standards of ethical and professional practice. I am delighted to welcome Lenny Schwartz of Pinnacle Roofing Professionals to the ranks of the industry’s leading solar professionals. For more information contact Pinnacle Roofing Professionals, LLC, www.pinnacleroofingpros.com 206.919.3538. Pinnacle Roofing Professionals believes in bringing confidence, security and superior craftsmanship to the residential and commercial community. Built on a Reputation of Quality, our goal is to be the best in the industry while building respect, trust and long-lasting relationships with our clients. When making an investment decision on a new roof or solar system, we are dedicated to working closely with our clients through consistent communication to identify their individual needs and goals and to provide them with sustainable, innovative, high-quality roofing and solar solutions. We use the latest cutting-edge technologies and top-of-the-line products. We focus on safety and educate our employees while contributing to the advancement of the roofing and solar industry and ultimately to the betterment of our community.